July 4th is a day to celebrate our freedom with family and friends. Here are some great July Fourth ideas for you to enjoy. Decorate your table with the classic red white and blue. Spread out a red or white tablecloth and then add accents to your taste. Add something blue such as a blue napkin, place mats or a table runner. 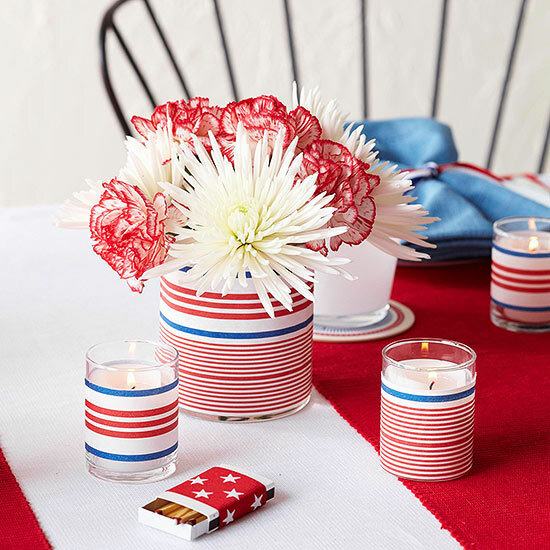 Place red white and blue ribbons to the flower vase, or tie a ribbon around your cloth napkins as a napkin ring. You can always add something healthy to your cupcake dessert by adding some fresh fruit that are plentiful this time of year. A fresh fruit platter with strawberries, cherries, raspberries, and blueberries make a healthy presentation and refreshing after a big meal. Last but now least have a game or an activity prepared for the children (or adults!) to do. It can be something simple as bringing some crayons along for them to create a picture or this cool twist on the classic hopscotch game. It makes a get together much more memorable and a great ice breaker when an activity is done together as a family. Wishing you all a happy July 4th and a great weekend. One of the positive effects of the current economic crisis is that it is becoming increasingly fashionable to dine at home once more. For a single person looking to mingle, dining in doesn’t seem to be the right way to go. Or is it? If you’re looking for an excuse to throw a dinner party and you want to get to know some new people, Yourtablecloth.com might have just the answer for you. How about a dating dinner? If you’ve tried online dating, speed dating, and blind dating and you’re reaching the point where it all seems a bit much or you just want to try something different, this can be a really fun way to spend an evening. Rope a couple of friends in to help you out with the planning and cooking and, if necessary, to share the cost. Decide on a theme. I’m going to suggest ‘chic and sophisticated’. Send out invitations to people who are also single, whom you may not know so well, friends of friends or online matches you would like to see in person. Make it a rule that everyone has to make the effort and dress up. This is a great and non-threatening way to meet people in person that you only otherwise know online. Decorate your table to match your theme. For my dating dinner I’m going to choose the elegant rectangle tablecloth that comes in a range of colors on the Yourtablecloth.com website. I like the idea of black. There’s something very cool about that. In terms of placemats I would choose the Parchment placemats, and I would compliment them with little name settings written in someone’s best copperplate handwriting, or if you’re really stuck, type them on your laptop and print them out. For napkins, choose a color from the elegant cloth napkin range (you have a fabulous range of 31 to choose from) that best matches your theme. For me, I’m going with red because this table is really going to make a bold statement! Use matching glasses, cutlery and crockery so that you can dress the table settings beautifully or borrow something from your friends. Make sure those glasses are shining! Decorate the table how you see fit. For a straightforward look you can opt for candles, but as this is a dating party I would suggest fairly lights. These will add sparkle to the ambience and that’s exactly what you’re after. Secondly, if you would like to use confetti, opt for the metallic variety. You could keep this all one color – silver to complement the place mats for example, or perhaps red to match the cloth napkins. Alternatively scatter crystal effect gems across the table. You will need to be careful about glasses over balancing however. Finally, place little dishes of heart shaped or love related sweets around the table. Get people in a receptive mood for the party as soon as they arrive. Purposefully choose music that is slow and has a steady beat, nothing too frantic. You want people to relax and chat to each other. Offer non-alcoholic cocktails to the drivers in your group. As the host or hostess your responsibility will be to break down some barriers and help people feel comfortable with each other so keep the chat going. Make all the introductions and try to set people at ease. Then serve your delicious dinner and keep everyone chatting. By the end of the evening your guests will know each other a great deal better and will have had a really fun evening out, thanks to your creative efforts. They’ll appreciate all the effort you went to and will remember your dinner table for a long time. Hopefully one or more of you will meet up again and the dating dinner will have proved to be a success. Why not send us a photo of your dating themed dinner table and we’ll showcase it on the blog?